Glorious sunsets every night. 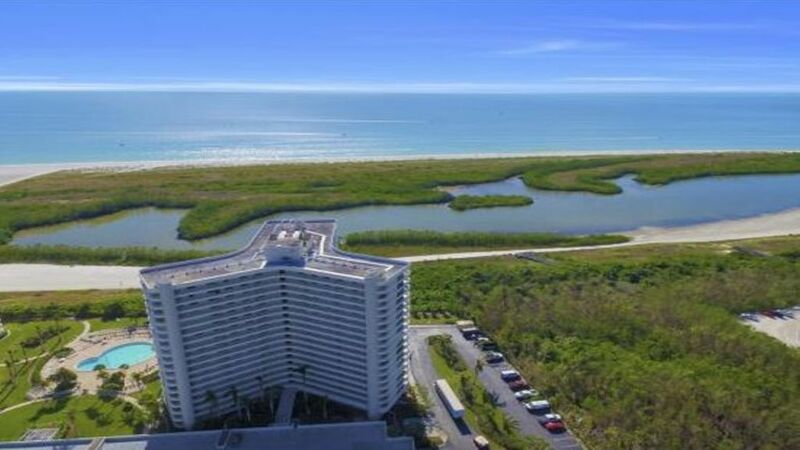 Achieve maximum serenity while looking out over the natural preserves at Tigertail beach. On a clear day you can see to Naples. . Come and enjoy this beautifully updated condo with an all new opened up kitchen, stainless steel appliances, granite counter tops, and all new living /dining room furniture. The condo is completely furnished with all the amenities of home. Large fluffy beach towels, beach chairs, floats, and toys for building sandcastles provided for the young and young at heart. It is the perfect location to walk the beach and pick up beautiful seashells. Just to the north is Tigertail beach with all water sport equipment available. Heated pool, well equipped fitness and exercise room and ten tennis courts on premises. Golf courses abound nearby. Great dining available on the island. World class deep sea fishing at the marina. . Wireless Internet available in the lobby. The perfect place for a tropical beach and sun vacation. We currently spend more than 6 months of the year on the island and are often there to handle any problems if they occur. We think of you as our special guests and try to take care of our condo so that you can have the best vacation possible. The South Seas Club condo's have a unique location. You have a beautiful natural preserve area at your fingertips, You can walk and enjoy nature in a virtually unspoiled way with the sound of the sea in your ears.. Yet you are close enough to all of the modern amenities that you need. Truly amazing is to be able to sit back and see all of the beautiful sunsets over the water. Sometime you will even be able to see the mysterious green flash. The property was very nice. We enjoyed our stay at south seas. The sunsets were beautiful. The pool was very nice and everyone was friendly. The walk to the beach was long, but the shelling was outstanding. The condo was nice. It would have been nice to have a washer and dryer in the condo itself. Also, the room facing the lights needs to have darker shades or darken curtains. It was much too bright for us. We loved the location. Marco Island is a beautiful island, many places to eat. We are truly sorry but the condo association does not permit washers and dryers in the individual units. Unfortunately, this is something we have no control over. We appreciate your comment about the curtains. I'm just a little disappointed that you did not give us a higher rating since you feel the condo was very nice. We also try to keep it well equipped for our guests needs. My family and I spent a week at Marco and had an amazing stay at this condo.We stayed the dates between July 16-July 23 2016. It was extremely cozy and comfortable, everything was perfect. Perfect way to relax and has an AMAZING view of the ocean, the sunsets are beautiful. Definitely and highly recommend this condo. The sunsets are just beautiful. View from kitchen while doing dishes. View from bed and sofa as well. Everything you need. More than enough kitchen supplies and towels, sheets, absolutely whatever you may need. Very secure condo. Comfortable king bed. You can go for long walks, go out to eat or do absolutely nothing at all. Great vacation. Also the owners are very nice to deal with. No complaints.